Because It's in your sub-conscious memory. Doing a N.E.T. session can neutralize the emotional trauma from a childhood memory, bringing you back to a place of "Peace" & " OK'ness" with the current issue you are having within yourself. I have personally been using N.E.T for the past 22 years in my holisticwith totally amazing results. My clients feel " relieved " when they leave my office. It's a good feeling to have. N.E.T. was first created in 1988 by Dr. Scott Walker, a chiropractor who receive the "Chiropractor of the Year" award in 1989 for his creation of the Neuro-Emotional Technique now commonly called = N.E.T. N.E.T. > is compared to the human body to a baseball diamond. Each base directly influencing the other bases. First Base, addresses the emotional factors of the body. Second Base, addresses the effects of toxins in the body. Third Base, addresses the nutritional needs of the body. Home Plate, addresses structural balance of the body. How is Complete Healing Attained ? When ALL of the below Four Base are addressed and balanced. Currently more than 10,000 practitioners from 30+ countries have completed the N.E.T. training. Helping thousands of people, around the world to get well. N.E.T. uses a acupuncture meridian body / mind entry point to identify and releases core emotion blocks from an earlier emotional event in some ones life that has compromized their inability to deal with their current stress they are feeling due to an old traumatic memory, of a past experience, with a similar memory, which may have the same emotional influence of their current experience from their past memory. An NEC is defined as a mal-adaptation syndrome adopted by a person in response to a real or perceived threat to any aspect of the person's survival. The primary goal of N.E.T. 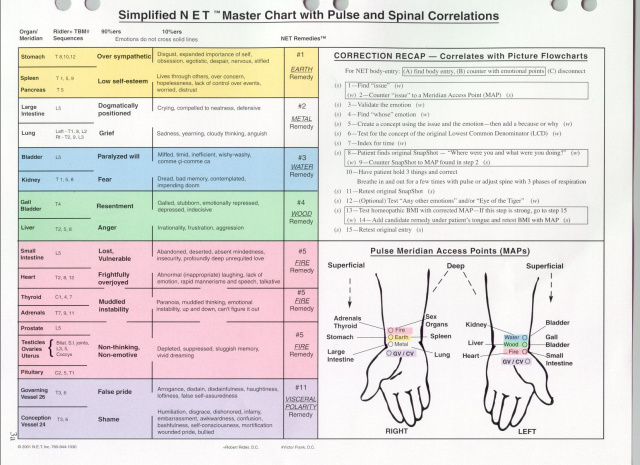 is to identify and resolve NEC's either an associated vertebral subluxation(s) or accessing active meridian pulse point(s). In a session, I will be guiding the person, to picture the original emotional event in their mind and connecting them with the past emotion of that past experience, the original trauma of that event, that was perceived as a threat to them, guiding them mentally to the same time frame of the original event, while holding a meridian emotional point. While breathing OUT the stuck emotion . Doing this procedure, The trauma, from the original event ( usually from Childhood ) is now neutralized & dis-charged into a state of neutrality, accessing peace & ease within the person's psychic. This Procedure, neutralizes old emotional beliefs and restores emotional stability for a peaceful & healthy state for optimum health. Interested in Clearing some OLD Emotional Garbage? I can help you be at " Peace with Yourself & Others"
The COST for FOUR sessions is only $360.00 > Normal cost is $800.00 You Save $440.00 Your Fourth session is FREE. I can do a remote session with you from anywhere in the world.